Hazard: The batteries packaged with the recalled flashlights are labeled as “Panasonic CR123A Industrial Lithium” and have been determined by Panasonic to be counterfeit. The counterfeit batteries can overheat and rupture, posing a fire and burn hazard to consumers. Incidents/Injuries: Sportsman’s Warehouse has received two reports of batteries overheating and flashlights igniting, with one consumer receiving burns to his hands. 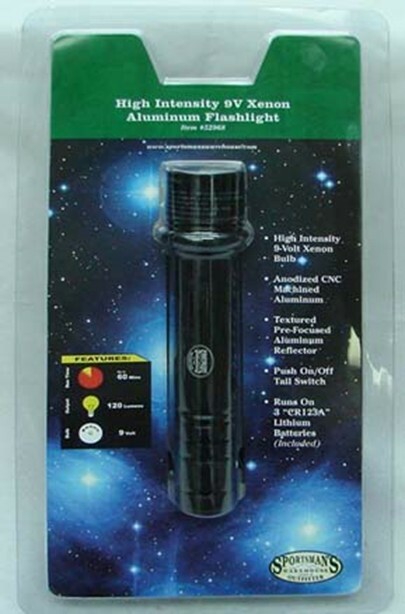 Description: The recall involves High Intensity Xenon Aluminum Flashlights in 6-volt (Item No. 1139422), 9-volt (Item No. 1139423) and 12-volt (Item No. 1139424) models. The recalled flashlights are black and have the Sportsman’s Warehouse logo printed on the handle. The recalled flashlights were packaged with two, three or four batteries labeled as “Panasonic CR123A Industrial Lithium”. Sold at: Sportsman’s Warehouse stores nationwide from October 2006 through May 2007 for between $30 and $40. Remedy: Consumers should immediately remove and discontinue using the batteries from the recalled flashlights. Consumers can return the recalled flashlights and batteries to any Sportsman’s Warehouse store for a full refund or store credit.